USA & India have so much in common. We share same beliefs and ideologies as two of the most powerful democracies in the world; we are both secular and believe in diversity – we even share a common language (though , as per Barnard Shaw, it is not English)! Industry was honored to have 3 outstanding contributors in the nation’s Padma award list this year! 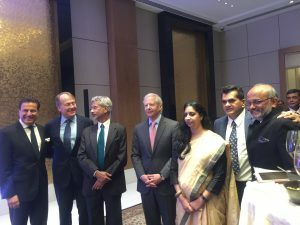 USISPF Chairman John Chambers, Founder & CEO, JC2 Ventures; Vice-Chairman Shantanu Narayen, Chairman, President & CEO, Adobe Systems & Board Member; Dr. S. Jaishankar, President- Global Corporate Affairs, Tata Sons have recently been conferred with India’s Highest Civilian Honours (Padma Awards). USISPF reception felicitated the Padma Awardees on 11th March evening – most key industry leaders and government leadership graced the occasion. In the photograph below, USISPF President, Dr Mukesh Aghi is seen with John Chambers, Jayshankar and Shantanu-. Niti Aayog CEO, Amitabh Kant and Secretary DOT, Aruna Sundarrajan are also seen in this photograph. An interesting comment from Jayshankar was the evolution of US- India relationship beyond just business into the next phase- captured succinctly in USISPF name , viz, strategic partnership. Both nations have so much to contribute to each other. CUTS-USA Forum has indicated that though India-US bilateral trade stands at $126 billion, it is possible to take this up to $500 billion in the course of the next decade. When deserving industry leaders are acknowledged in this manner, the resulting positive strokes can build on the dream of a powerful alliance, strong business foundation and a wave of free and fair trade led economic and social transformation for both nations.